Tag line: "Keep An Eye Out For Dr. Chaney...He Needs It!" I wasn't very impressed with the first 20 minutes or so of Mansion of the Doomed, which had all the makings of a typical, run-of-the-mill psychological thriller, with flashbacks, dream sequences, and a whole lot of voice-over narration. But as the movie progressed, I found myself increasingly engrossed in this story of medical experimentation, and by the time it was all over, I was even a little shaken up as well. Noted surgeon Dr. Leonard Chaney (Richard Basehart) is obsessed with the prospect of curing his only daughter (Trish Stewart), who was blinded in an auto accident. Facing insurmountable odds, Chaney is nonetheless convinced he's perfected a new surgical procedure, during which healthy eyes are transplanted into a blind patient, thus restoring their sight. Unwilling to take his findings public, Chaney, with the help of his assistant, Katherine (Gloria Grahame), experiments in his basement laboratory, where he lures unsuspecting 'donors' prior to rendering them unconscious and stealing their eyes. Each failure results in the need for new and healthier donors, forcing the good doctor to seek out victims on a regular basis. Mansion of the Doomed opens slowly, with Chaney taking us through the events that led him to attempt a surgery no one before has dared try. We see the accident that started it all, and are forced to listen in as Chaney rambles incessantly about his daughter, his life, and the belief he's stumbled upon a medical miracle. It's all very rushed, even somewhat confusing, but things improve the minute he goes to work on the first 'donor', Dan (Lance Henriksen), a colleague and his daughter's former fiance, whom he drugs during a dinner party. This first operation is a success, and Chaney's daughter is able to see through what had hours earlier been Dan's eyes. The next day, however, her body rejects them, and she's blind once again. So, Chaney drugs more people, performing the same procedure over and over again with no success. Along with the tension generated by each new operation, we also pay the occasional visit to the unwilling donors, whom Chaney refuses to kill because he's convinced he'll soon be able to restore their sight as well. All are locked away in a basement cage, healthy except for the fact they have no eyes. As more and more are added to the mix, they slowly start to organize a break-out, with Dan acting as their leader. It's a disturbing thing to look on people whose eyes have been ripped from their sockets, and because Chaney is unable to perfect his medical 'breakthrough', their numbers continue to mount until there's no room left to hold them. The secondary story of these blind prisoners is well handled, and adds the right level of creepy to what otherwise might have been a pretty mundane tale. 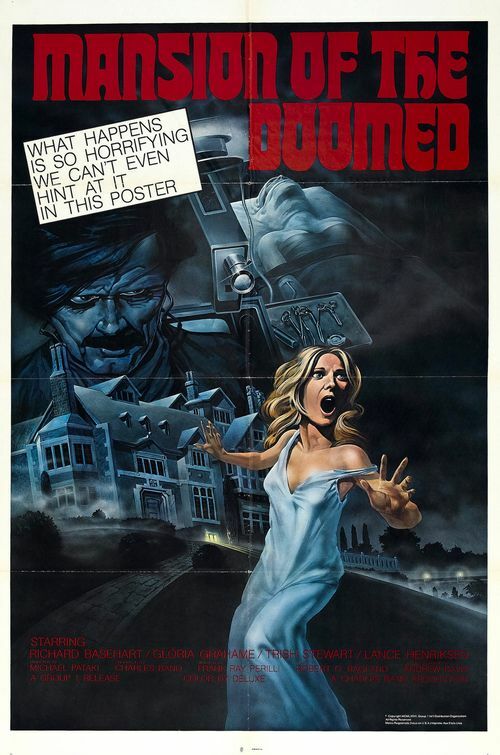 So, my advice if you choose to watch Mansion of the Doomed is to hang in there; it may not look like much at the start, but it gets a whole lot better before it's over.